In this part of The Dream of Gerontius, Newman teaches us a lot about the angels. The soul of Gerontius begins telling us the mission of the angels. The angel recounts the “long relentless fight” to win his human charge purchased by Christ at so great a cost. “O man, strange composite of heaven and earth! 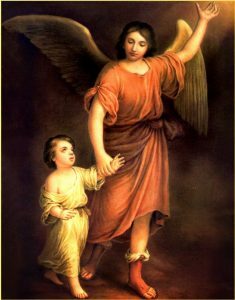 That “conscious communion” is an awareness of the inspirations of the guardian angel, affection for and obedience to him. Like Blessed Newman and all the saints, we, too, should strive to hold conscious communion with our angel, and with his assistance prepare to meet Christ.